Described as the largest, most technically demanding wreck removal operation ever attempted on a ship of its size, the wrecked Costa Concorda cruise liner was successfully removed from an idyllic slice of Italian shoreline in July 2014. For two and a half years, the gnarled cruise liner sat in protected marine waters, glowering at tiny Giglio Island, a quiet community connected to Tuscany only by colorful ferries. Read the Crowley Maritime Publication. Crowley Maritime subsidiary TITAN Salvage and partner Micoperi began the process of refloating the Costa Concordia and is now safely moored at the Port of Genoa Voltri, Italy, marking the completion of the largest maritime salvage jobs in history. Watch a time-lapse video of the refloat here. To watch a live feed of the refloat site, please click here. To watch a video demonstrating the refloat and removal stages, click here. Check out this video tour of the floating vessel. Updates can also be followed on Crowley Maritime’s social media sites, including Facebook, Twitter and Google+. Friday, July 25; 4:15 p.m.: CostaConcordia is moving along as expected today. With calmer seas and slight winds, Crowley Maritime and Titan Salvage have announced the arrival to Genoa would be in the early morning hours of Sunday, July 27. After 30 hours of navigation, the Concordia has travelled for 63 nautical miles at an average speed of 2 knots. At the moment, the convoy is located between Isola d’Elba and Corsica. The sea is calm, while the wind has a North/North East direction with a speed of approximately 13 knots. The assessments performed on sponsons and they connections – cables, chains and strand-jacks – have given positive results. The climate on board is calm and the navigation proceeds without problems. There are no signs of environmental pollution; environmental monitoring by public institutions are in progress, as well as samplings carried out by the marine biologists of University La Sapienza that have been appointed by Costa Crociere and the Titan Micoperi consortium. For tomorrow marine conditions are forecasted good, with light winds coming from the South. With these conditions, the arrival of the Concordia in Genoa Prà-Voltri port is expected for Sunday July 27th at 3 in the morning. Monday, July 21; 4:30 p.m.: Departure of the Costa Concordia planned for Wednesday July 23rd. Monday, July 21; 2:00 p.m.: Costa Concordia is close to being towed. Crowley and Titan Salvage teams have been working through the weekend, despite the strong winds, and the wreck has emerged about 11 meters. There are three more meters to reach the required draft for towing. Starboard sponson S4 is almost in position. Work is in progress to lower sponsons S5 and S14. Friday, July 18; 3:00 p.m.: The Concordia has emerged of an additional meter, up to deck 5, reaching on average 4 meters of refloating. One chain and three cables have to be connected. Work will go on all night. Tuesday, July 15; 1:00 p.m.: The underwater activities related to the refloating of the Concordia are in progress today. Technicians are now working to connect and tension the last four chains and six cables. The wreck is in a stable position and securely moored. Monday, July 14; 8:00 p.m.: The first day of the refloating operation of the Costa Concordia has concluded successfully. The wreck is now afloat thanks to the buoyancy given by sponsons and it has been towed about 30 meters eastward. The wreck is securely moored and therefore the first phase of the refloating operations has now ended. Around and under the Concordia operations are still on going to connect some chains and cables to the sponsons. Monday, July 14; 12.00 p.m.: The Concordia’s stern and bow are now detached from the false sea bed by about one meter. The wreck is floating thanks to the sponsons. Before being towed 30 meters east, the Concordia will need to be refloated another meter. Technicians have now begun to tighten the chains on starboard sponson S14, as planned. Monday, July 14; 8.30 am: With the arrival of the ferry at 8:30 a.m., the final phase of the lightening of the wreck has begun. Only less than 1,000 tonnes of weight remain, out of the initial 30,000 tonnes; as soon as this step is completed, the wreck can be lifted off the platforms. In the first stage, this will happen in the stern area. Monday, July 14; 6:00 am: The Concordia refloating operations have started regularly. At 6:00 a.m. Senior Salvage Master Nick Sloane reached the Remote Operations Center, located on the Concordia, with the rest of the team. Now that the Concordia is afloat, the wreck is ready for transportation to its final destination, the Port of Genoa Voltri. This operation will be directed by Titan-Micoperi and carried out in compliance with the applicable laws and regulations and in accordance with the terms of the approval granted by the authorities (Coast Guard). The method of transport that has been selected is traditional towage. Careful analysis conducted by experts from RINA (Italian Shipping Register) has confirmed that the hull is suitable for towing, with the structural strength and capability to safely undergo the transfer even in conditions with a maximum wave height of 2.6 m, which statistics show to be highly improbable at this time of year. The convoy will proceed very slowly, at an average speed of two knots. The time window for the transportation falls in the period statistically characterized by the best sea and weather conditions. The convoy will consist of the Concordia plus at least 10 other vessels. There will be two tugs – with a safe working load (SWL) of 135 metric tonnes – at the ship’s bow towing the hull. Another two auxiliary tugs will be positioned aft. The other vessels in the convoy, including a pontoon with a 200-tonne crane, will carry personnel and equipment. A team of marine biologists will also be present during the tow and the convoy will be preceded by a specialized marine mammals-watching vessel. The Concordia wreck removal is an extremely complex technical engineering feat – considered the biggest salvage ever attempted on a ship of its size – with the deployment of the finest international expertise, state-of-the-art technology and unprecedented financial resources. The priorities of the project were clear from the outset: respect for the environment, workplace safety and protection of the Giglio’s island socio-economic fabric. 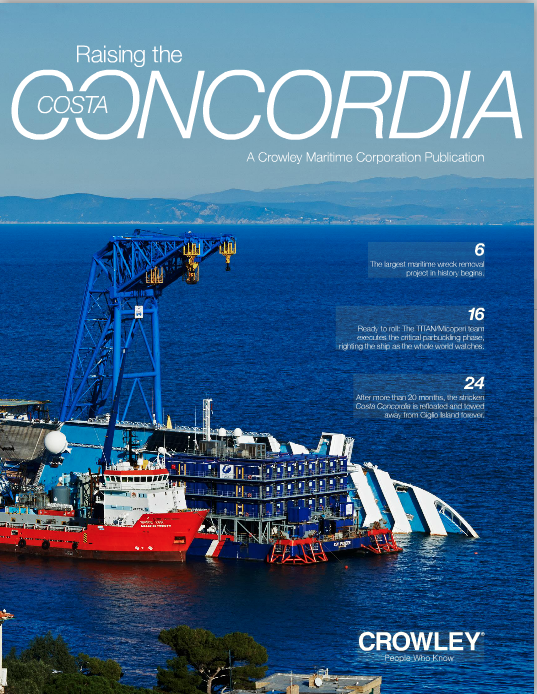 The Concordia wreck was rotated to a vertical position via successful parbuckling operation in September thanks to the efforts of Crowley Maritime subsidiary Titan Salvage and partner Micoperi.